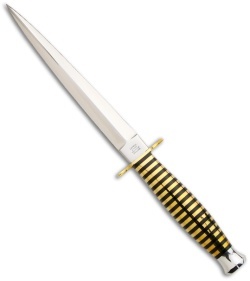 The Fairbairn-Sykes commando knife is a double-edged knife with a foil grip developed by William Ewart Fairbairn and Eric Anthony Sykes before World War II. It was made famous during the War when issued to British Commandos, including the SAS. Although the Fairbairn-Sykes knife is now of interest mainly to collectors, because of its sleek lines and its commando associations it still remains in production today. The balance of a Fairbairn-Sykes is a crucial part of the design and it takes careful forging and production to ensure that the knife balances exactly as designed. The hilt should fit easily in the hand and the blade should not be so heavy that it tends to drag the hilt from the fingers in a loose grip. During World War II, Scorpion Knives were one of the original companies forging high quality Fairbairn-Sykes knives for use by the allied forces. Today, Scorpion Knives produces Fairbairn-Sykes knives mainly for enthusiasts. We continue to manufacture these with a precision that ensures you receive a perfectly balanced Fairbairn-Sykes commando knife worthy of adding to your collection. 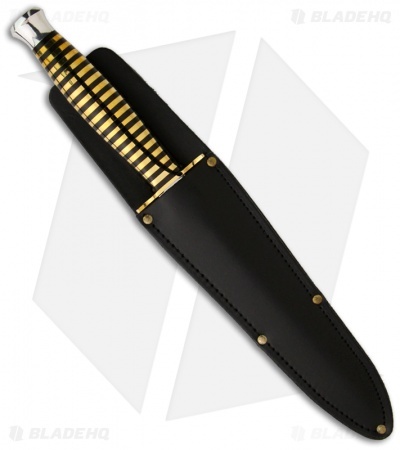 This Scorpion Knives Fairbairn-Sykes knife has the rare "Wasp Pattern" with a polished blade and destinctive handle comprised of stacked layers of brass and compressed black fiber washers, something that takes great care to manufacture. It comes with a leather sheath and a high quality lacquered wood presentation cases.